In partnership with the Permanent Peoples' Tribunal Session on the Human Rights Impacts of Fracking, we are exploring whether or not there are human rights issues at stake in fracking. In what ways does fracking affect climate change, ecosystems, and human health? Join our contributors in considering the impacts of hydraulic fracturing on human well-being. Over the past eight years I have had the privilege of sitting at kitchen tables and in local restaurants with rural people listening to their hopes and fears. 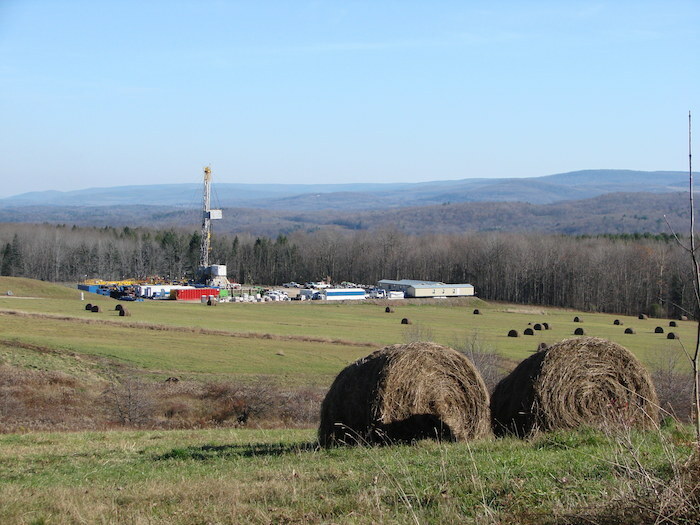 These listening sessions began in 2009 in Pennsylvania's north-central Endless Mountains as gas companies and their contractors arrived in Bradford County to begin developing deep, Devonian-era Marcellus shale gas (with a process known as fracking). Against a noisy backdrop of a shale gas boom dominated by liquids tankers, fracking trucks, and white pick-ups rolling continuously down the road, people share with me their fears about the future of their land, soil, water, grandchildren, and livelihoods; their expectations about getting wealthy or losing it all; and the life-altering decisions they are struggling to make. Decisions can be a struggle not because of what is known, but because of what is unknown. In order to make well-informed decisions, one has to have access to information about trade-offs. Sure, people know about the benefits of the shale gas developments. The benefits are plastered on billboards across the County: more jobs and a better economy, not to mention fewer foreign wars over oil. However, people still know little to nothing about the costs of these developments, costs that will be paid by their families, communities, and local environment. Perhaps an answer to this provocative question "Does fracking violate human rights?" is contained within these listening sessions and my ongoing work in Pennsylvania. The right to freely express opinions and beliefs, the right to participate in governance, and the right to information required to carry out these expressions are basic human rights, as outlined in Article 19 of the Universal Declaration of Human Rights and as protected by the United States of America's Bill of Rights. [2, 3] As an applied social scientist focusing on communities affected by fracking, I interpret this to mean that every person—regardless of their background, belief, or expertise—has the right to access information that allows them to make informed decisions for themselves and their families and to openly participate in public discourse and debate about the pros and cons of fracking and related fossil fuel developments. So are the people living in and around shale gas fields being afforded these rights? Over the course of the past eight years, water coming from private drinking water wells in Bradford County, Pennsylvania has turned from clear and clean with little to no total dissolved solids to white, black, purple, rusty orange, fizzing and gelling, and in a few cases, the water has disappeared entirely. Such changes may last one day to two weeks or more. These changes are sometimes accompanied by a strange smell that one farmer aptly described as “death.” All of these water resource changes happened not gradually or consistently, but overnight and inconsistently. So, what happens when people complain that their water has become undrinkable or it has changed significantly in color, in odor, or in taste? When questions or concerns are raised by local residents about drinking water problems at public outreach meetings around Bradford County, the residents are given misleading statistics regarding the ratio of drilling to contamination events and limited open information-sharing and discussion about potential environmental and social costs of drilling. At the County level, coinciding with a series of lengthy and heated public meetings on water contamination and related health concerns related to shale gas developments, the Commissioners issued guidelines limiting information-sharing and discussion opportunities for the public at future meetings. Similarly, a formal Public Participation Policy to govern all County Planning Commission meetings was implemented at the same time that a controversial series of zoning changes related to a frack waste disposal site were proposed. While these guidelines and policies can be touted as good and efficient government, in reality, they are a bureaucratic way of suppressing open discussion of the environmental and social costs of shale gas developments. In local townships (and the County) there have also been slanderous personal attacks and even arrests of local farmers and landowners who have spoken out publicly about accidents they have witnessed or who have asked specific questions about industry practices and called for greater accountability by companies or more regulation and enforcement by Pennsylvania Department of Environmental Protection (DEP) and other government agencies. A letter from the office of a Pennsylvania elected official to a Pennsylvania resident gave the names of individuals who had filed complaints with the DEP about their private water wells being damaged by shale gas developments. The complaint summaries contained in the letter went on to label some of the citizen complainants as “anti-drilling.” The elected Representative noted in the letter that these complaint summaries, both the names and detailed descriptions, were from staff at the DEP. Such dismissive public outreach meetings, questionable local government reactions, local bullying, and state government characterizations of citizens as “anti-” or “activist,” particularly in small rural communities not accustomed to or supportive of “activism,” has a range of social, political, and psychological fallouts. It also has a palpable, chilling effect on free speech, information-sharing, and public debate. In my assessment as an expert observer of social and political behavior, the local people and complainants seeking relief or asking these questions are not seeking information in order to stop the developments (as opposed to outside activists seeking to stop or slow down fracking). These are requests for more complete information about shale gas drilling and fracking from residents who need to make a well-informed decision about whether all of the technologies and activities involved are in fact safe and, if they are not safe, what they will need to do to protect themselves and their families. In cases where a person has already been harmed in some way, they are seeking remedy and relief for their situation and in some cases answers to why or how they were harmed. The people asking for this information are farmers and timberland owners concerned about making the best decision to protect and sustain their livelihoods, their families, and the places they love and call home. The people I have sat with and listened to over the past eight years have not been afforded the right to information, the right to freely express their opinions and beliefs, nor the right to participate in local decision-making. Under the pretense of economic development, energy independence, and government efficiency, the local and state government have violated their basic human rights to information, self-determination, and opportunities to participate in governance. It is growing clear to many of us who work closely with people who live in these shale oil and gas frontier communities and along the transportation corridors carrying shale oil and gas to market that the violation of these rights continues to put the livelihoods and lives of people living in these communities at risk. Comission on Human Rights, Fifty-sixth session Item 11 (c) of the provisional agenda Civil and Political Rights including the question of: freedom of expression, Report of the Special Rapporteur on the promotion and protection of the right to freedom of opinion and expression, Mr. Abid Hussain, submitted in accordance with Commission resolution 1999/36, 18 January 2000, Page 15. See also Annex II The Public’s Right to Know: Principles on Freedom of Information Legislation. June 1999, within this same document. Retrieved from http://dag.un.org/bitstream/handle/11176/228948/E_CN.4_2000_63-EN.pdf?sequence=3&isAllowed=y. The United Nations. (1948). Universal Declaration of Human Rights. Retrieved from http://www.un.org/en/universal-declaration-human-rights/. The National Archives. (2016 October 6). America’s Founding Documents: The Bill of Rights. Retrieved from https://www.archives.gov/founding-docs/bill-of-rights-transcript. Bradford County Commissioners Office. (2011 April 14). Press Release. 2012 September 26 and 2012 October 01 Letters from Representative Curt Sonney, Pennsylvania 4th Legislative District. "Gas Rigs Equip – Fall 2009, Bradford County" by Simona Perry. Dr. Simona Perry is Founder and Research Director of c.a.s.e. Consulting Services, Vice-President of the Board of Pipeline Safety Coalition, and Civic Professionalism Director of the Livelihoods Knowledge Exchange Network (LiKEN). She sits on the steering group of the International Permanent Peoples' Tribunal on the Human Rights Impacts of Fracking.